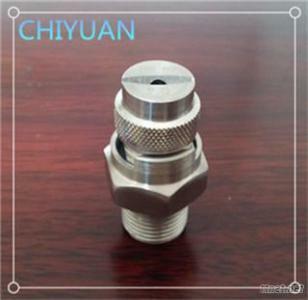 Quick-connect nozzle adopt new design-body and spray tip can be quick detached without any tools, which reduce much maintenance time. There is a builtin link stopper inside spray tip which make sure to fix precise location when connecting with the body. It avoids wasting time to adjust by hand. Quick-connect nozzle made by new design, adopt glass fiber reinforced poly propylene (fiber content: 25%) and PVDF. Both have advantage of resistance to chemical corrosion and abrasive wear. Glass fiber reinfotrced polypropylene max operating temperature is 82°C. PVDF is a high purity material, which can keep highly purified processing environment and max operating temperature is 148°C. The quick-connect nozzle has three size 1/8”, 1/4” and 3/4”. The Nitrile rubber O ring can make sure absolute seal between body and spray tip. The spray tip can provide three types of spraying: flat fan, full cone and hollow cone, with several flow rate and angle for your choices. 1. Production of print circuit board. 3. Phosphating of metal components.